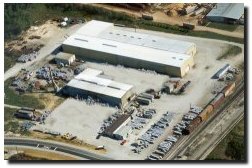 An arial view of Four Star Fabricators. Four Star Fabricators, Inc. is a privately owned corporation and has been in business since 1981. We currently employ seventy people and operate two shifts at a competitive shop rate. Our main expertise is in the field of plate metal fabrication, processing approximately 8 million pounds of steel per year for the coal, aluminum, and power industries. Some of our customers in the aluminum industry are Alcoa, Alcan, Noranda, and Commonwealth Aluminum; in the coal industry are Peabody, Black Beauty, and Kindill; in the power industry are Indianapolis Power and Light, Cinergy Indiana, and Vectron Gas and Electric. The 65' x 400' plate prep bay has six overhead cranes (ten to twenty-five ton), one 750 ton x 20'-0" bed Pacific press, 500 ton x 18'-0" bed Pacific Press, Esab Computer Controlled Burning Machine with six cutting head and one plasmic head, a 135 ton x 10'-0" Pacific press, a 5/8" x 12'-0" Pacific shear, a 5/8" x 8'-0" Roundo plate roll, and numerous other fabricating machinery such as ironworkers, punches, cold cut saws, etc. The 60' x 300' fabrication and weld out bay consists of four overhead cranes (five to twenty-five ton) and twelve work stations with two ton jib cranes. We have the welding capabilities of stick, hard wire, flux cored wire, mig, tig, and aluminum. The 65' x 75' paint bay contains a five ton overhead crane and is used for finish work, all types of painting, and installing tile and ceramic. We have a 30' x 75' machine shop with a five ton overhead crane and three engine lathes (up to 42" swing), two 13" pass thru stem lathes, one #5 Cincinnati mill, two Bridgeport mills, two large Ikeda drill presses and an assortment of other machinery. We would like to stress that plate metal fabrication is our first priority and the machine shop was installed as an outgrowth of our own needs. Located on the property are two outside all terrain cranes and a 30' x 50' maintenance building. Our delivery fleet includes one straight truck with 22' bed, three semi tractors, and six semi trailers consisting of one dropdeck, one extendable drop back, one 60' extendable, one 48' steel flatbed and two 48' aluminum flatbeds..